Home Croakey news and projects Previous projects #JustJustice Where’s the #JustJustice in NT teenagers being hooded, transferred to adult prison? 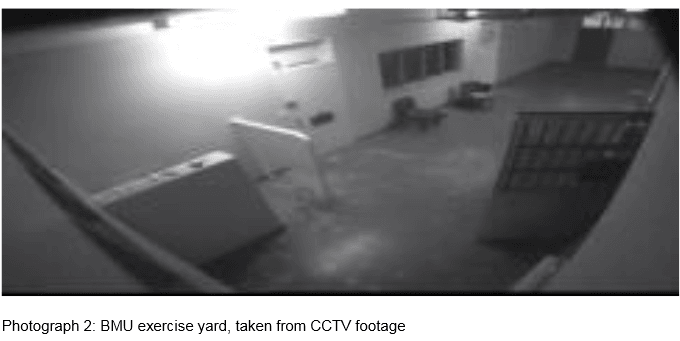 The Human Rights Law Centre has requested a United Nations investigation into the mistreatment of young people at the Northern Territory’s Don Dale Detention Centre, after the NT Children’s Commissioner report into an alleged 2014 riot by six juvenile detainees detailed “cruel, inhuman and degrading treatment” inside the facility, including prolonged solitary confinement, use of dogs and tear gas, and hooding and cuffing as restraint practices. In the article below, republished here as part of Croakey’s #JustJustice series, Amnesty Indigenous rights campaigner Roxanne Moore examines the reports findings and calls on the the Northern Territory Government to drastically overhaul the justice system for kids and ensure they are being rehabilitated, not mistreated. A report by the Northern Territory (NT) Children’s Commissioner reveals shocking treatment of juveniles at Don Dale Youth Detention Centre. The report comes after NT Correctional Services staff were found to have used tear gas on kids following an attempted escape on 21 August last year. The recent report shows six Indigenous children were in confinement “for periods of between six and seventeen days” in the lead-up to the tear-gassing incident. And it gets worse. Some kids were left in confinement for long periods of time without access to water or natural light. Imagine being locked in a windowless cell, with no fan or air conditioning, or tap water, for three days. It is inhumane and such treatment could constitute torture under both domestic and international law. It comes as little surprise that kids tried to break out of the cells. During the commotion, three officers were called in from the adult prison. They were wearing gas masks, and held riot shields and batons – a reaction completely out of proportion. When one child tried to climb out of a window, audio from camera footage captured an officer using swear words to describe the child. Before realising he was being recorded and laughing it off, the officer was also heard saying he would ‘pulverise’ the child. One child later told his caseworker that he thought he was going to die. He and another child hid behind a mattress and said their goodbyes during the gassing. Following the tear-gassing, the boys – one as young as fourteen – were handcuffed and transferred to an adult prison. To force them into compliance for the transfer, the boys were hooded with anti-spit masks. The youth detention centre did not have the authority to transfer the 14-year-old, but did so anyway. He was transferred back only when they realised it was illegal. Two children who were not involved in the disturbance were also gassed, transferred and punished. Why is this particularly concerning for Indigenous youth? The lack of support given to Indigenous people by our governments has lead to a massive over-representation of Indigenous youth in detention. Failure to address the underlying causes of offending, including poverty, intergenerational trauma and substance abuse, compounds the problem. The NT has one of the highest rates of Indigenous youth in detention. Between July 2013 and June 2014 Indigenous young people average 96 per cent of all young people in detention, while making up only around 44 per cent of the population aged between 10 and 17. Nationally, Aboriginal and Torres Strait Islander young people account for just over 5 per cent of the Australian population aged between 10 and 17, but more than half of those in detention. Our Government needs to drastically overhaul the justice system for kids and ensure they are being rehabilitated, not mistreated. It is outrageous that Australia refuses to rule out sending kids to adult prisons. Australia must live up to its obligations under the Convention on the Rights of the Child and make sure children are kept separate from adult prisoners. We also need to advocate for Australia to immediately ratify the Optional Protocol to the Convention Against Torture and set up a National Preventative Mechanism. This will enable us to hold our Government to absolute account for these atrocities. Our Community is Everything campaign, launched in June 2015, focuses on the over-representation of Indigenous kids in detention. Sign up now to support the campaign and let Indigenous kids know you stand with them. 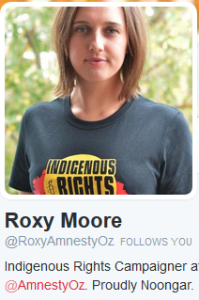 Roxanne Moore is a Noongar woman from the South West of Western Australia. She is an Indigenous Rights Campaigner with Amnesty International Australia, and tweets at @RoxyAmnestyOz. This article was published at Amnesty International Australia and is republished with permission.